More than 46 hours later, the credits are rolling on Bloodborne. I’m breathing a sigh of relief. The hunt may be over, but I won’t soon forget the city of Yharnam. Bloodborne is a tremendous accomplishment. The latest game from Dark Souls director Hidetaki Miyazaki and his team at From Software, it is both a surprising refinement and reinvention of the Souls formula. Even though I’ve “beaten” the game, I want to jump into New Game Plus and keep slicing up monsters. 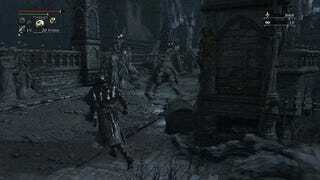 Bloodborne is a third-person action role-playing game for the PlayStation 4. In it, you play a man or a woman who picks up a variety of sharp and deadly weapons and fights all manner of horrific beasts, gradually growing more powerful while exploring a sprawling city and gradually uncovering its mysteries. The game takes place in Yharnam, a once-great and proud city known for its discovery of the art of “blood healing.” A sickness has taken root, however, and it’s turning the citizens into horrendous beasts. Your character is sick, too, and desires what medicines Yharnam has to offer. So, at the start of the game, you decide to partake of the blood and join the hunt, a regular event in which the bravest of Yharnam set out into the night and slay their transformed friends and family. Let’s start by acknowledging that From’s games have a certain reputation. Yes, Bloodborne is hard. No, it won’t hold your hand. But the mystique of the Souls games is overblown. You can play them. I believe in you. I used to think they weren’t for me. “Oh, these games were for my teenage self, back when I endless free-time in the summer and winter, not an adult with limited time and less nimble fingers.” That’s not true at all, and don’t let the rhetoric surrounding Bloodborne throw you off. You don’t need to have played Dark Souls to enjoy Bloodborne, and you don’t need to be an expert gamer to have a good time. Players are given access to an assortment of swords, hammers, and other dangerous objects, and there are key differences between each weapon. Each can transform in some way: the saw cleaver extends but takes longer to strike, the rifle spear doubles as a gun, the “kirkhammer” swaps a sword for a block of stone, and so on. You can transform your weapon mid-combo, leading to some dynamic, unpredictable attacks. It’s immensely satisfying to stab a werewolf with a sword, disabling him for a moment, then swap to a hammer mid-swing, stomping his head into gooey bits. Demon’s Souls, Dark Souls, and Dark Souls II were sword-and-shield experiences, at least for me. I bumbled around in humorously bulky armor, absorbing whatever enemies could throw at me. It only took me a few minutes with Bloodborne to realize it had been designed to specifically prevent me from playing that way. Bloodborne wants you to be aggressive, and it’s built several systems to accommodate this change in style. When an enemy hits you, you have a brief window to gain that health back. This is a huge change. Previously, one might be tempted to run away and cautiously heal after an enemy launches a powerful assault, but in Bloodborne, you’re likely to be better served by immediately hitting back. “Retreat and heal” is a tough habit to break, but the game, in typical Souls fashion, punishes you for not complying. Once you get used to staying uncomfortably close to enemies, taking your licks, and licking back, it’s a whole new world. A really fast world. Your character’s movement changes based on whether you’re locked onto an enemy. Most of the time, the circle button performs an evasive roll, but when you’re locked onto an enemy, it becomes a speedy dash. Thanks to that, it’s now possible to pull off some stylish (and useful) dodges that will also keep you out of reach. Bloodborne’s all about avoidance, about taking advantage of an enemy’s arrogance to punish them for overcommitting. This is true when it comes to both dodging and to parrying. A well-timed dash can elegantly move you from the edge of a creature’s blade to safely behind their back, ready to crush them with a charged attack. While parrying—using careful timing to deflect an incoming blow—was a rewarding but optional part of combat in the other Souls games, it’s an essential tactic in Bloodborne. It’s a prize for waiting until the last second before an enemy strikes, popping them in the face with your gun, and gutting them. I don’t play games to feel proud, but when I think about my favorite moments in Bloodborne, my heart skips a beat and I have to catch my breath, At one point, I spent hours banging my head against one of Bloodborne’s later boss encounters, in which you’re asked to juggle three fast-moving enemies simultaneously. It’s rough. It was late at night, my wife was asleep, and I’d come close to giving up and going to bed. Then, it all came together—the perfect fight. I dodged at the right time to avoid a fatal blow, I attacked at the right time to land my own. The enemies disappeared. I’d won. Just looking at those text messages makes me smile. Not many games are like this. These are the reactions Bloodborne elicits from its devoted, patient players. Layers of skill, earned through hours of frustration, are rewarded with an explosion of joy. 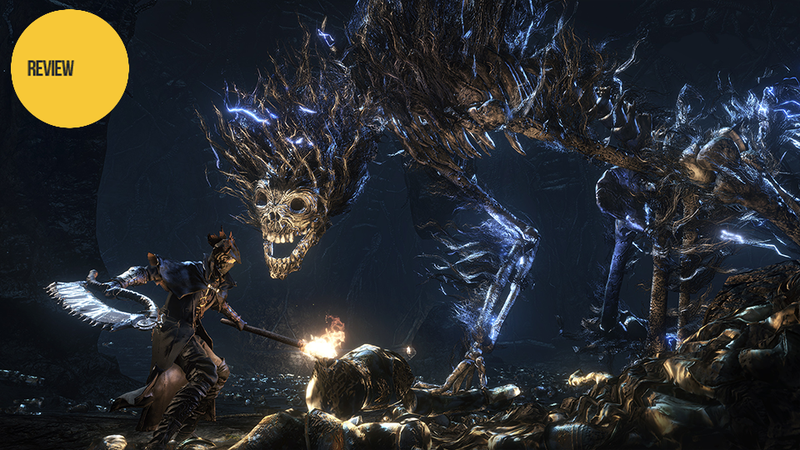 When Bloodborne clicks, it takes over—it’s a game that quietly seeps into every corner of your psyche. When you’re not playing Bloodborne, you’re thinking about it, or even (true story) dreaming about it. For a time, Bloodborne was life, and life was Bloodborne. Addicted is the wrong word. I was enthralled. You may spend most of the game fighting for your life, but there’s a story here, too. Mostly, you’ll discover heartbreaking vignettes about the lost residents of Yharnam. Knock on a window and you’ll find a little girl hopelessly looking for her mother. You eventually find her mom, but she’s met with a tragic end. Another character barely hangs onto life, and even provides you with several useful items! Towards the end, he’s unable to keep going. Not to get all BuzzFeed on you, but what happened next, well, it made me pause the game for a moment. Your victories in Bloodborne are tremendous, but you’re surrounded by sadness. The storytelling in Souls games can range from straightforward (Demon’s Souls) to incredibly vague (Dark Souls II), and Bloodborne falls somewhere in between. I’d developed a cloudy idea of the story’s big-picture events by the end, but I’m not sure I could fully put it into words, and it’s still not clear to me why my character was killing so many things, rather than out looking for a cure. (You know, ostensibly the reason you came to Yharnam in the first place.) Still, while the lore is interesting, it’s not what I’m here for. The important story isn’t found in any text or dialogue, it’s my understanding of how to play Bloodborne. It’s finding a new lantern in a dangerous area, just as I’ve run out of blood vials. It’s effortlessly downing a difficult boss after he’s spent the last hour tearing you from the inside out. Those are the stories you tell your friends, and that’s what sticks with you in the days after. Bloodborne is a remarkably mysterious game. The fundamentals are explained well, but everything else? Good luck. That’s part of the charm—you’re meant to poke, prod, and share theories with fellow players. Yharnam can’t be “solved” alone, and the game encourages collaboration with fellow hunters in several ways. The level designers behind Bloodborne are often tricking you with misdirection, and the notebook allows players to participate, as well. You can’t come across a hole in Bloodborne without one note suggesting you jump in to find treasure and another one warning of a liar. You’re allowed to give a thumbs up or thumbs down to notes, as well, and players will often approve notes designed to lead towards peril. When that happens, you can’t help but laugh. It’s not always about misdirection, though. The beasts you face on a regular basis in Bloodborne are monstrous and unsettling, but their design serves multiple purposes, and the game’s art is often trying to subtly communicate with the player. Take the game’s first boss, Cleric Beast. The first takeaway: holy crap. The second takeaway: how the heck am I going to kill this thing? Let’s watch the Cleric Beast in action for a second, though. It’s a little tough to notice in this GIF, but his skinnier left hand isn’t able to sweep the whole area, while his bigger right hand can. If you watch the Cleric Beast for a little while, it’s clear he’s actually favoring the right hand. This is the game trying to teach the player both through art and design. With some patience and careful observation, which is understandably difficult to pull off in a stressful situation like a boss fight, Cleric Beast becomes very easy to kill. How? Just roll to the left, and he’ll rarely be able to hit you. You’ll go right under his arm. Bloodborne does this all the time. The game’s individual pieces—combat, art, design—work in concert to have a conversation with the player. You only need to listen. There are surprises around every corner, and sometimes those surprises show up in areas you’ve already committed to memory. This is how the game keeps you on your toes. Bloodborne isn’t a multiplayer game in the traditional sense—there’s no separate mode—but other players impact your game all the time. Ghost-like apparitions float in and out of your world, fleeting glances at what’s happening around you. Blood stains trigger replays of how other hunters died. Seeing another hunter alive and well is a small, but welcome, comfort. If they can do it, so can you. Besides the notebook, you can temporarily “summon” others to tackle challenging areas together. The moment a boss is vanquished, they disappear. When you bring someone in, though, it means a player with ulterior motives can “invade” your world and kill you. Since you cannot know the intentions of other players, it’s a roll of the dice. It’s less risky than these games used to make it, so consider yourself lucky. In the past, it was possible for players to invade far more often. I sorta miss that, actually, but I might be alone there. At first, that’ll make no sense at all. Eventually, you’ll get a few different bells, and will learn that you can spend Insight points to ring the bells, which invite players to come join you in your game. Simple enough. The game never explains any of that, it leaves it to you to figure it out. Or, for another example: There’s a point where a new enemy shows up in familiar areas. Bloodborne knows the player is starting to feel cocky, having established a sense of control. This enemy can kill you with a single attack, and he probably will—that’s the point. And when he kills you, something entirely unexpected happens. That sort of unforeseen moment, a mixture of fear and delight, is commonplace in Bloodborne. The game enjoys pulling the rug out from under you the moment you get comfortable, resulting in head-scratching and “omg wtf” texts to friends. The head-scratching even extends to your character sheet, though not for the best of reasons. Bloodborne is an uncomfortably simple game when it comes to player customization. You just don’t have many options at first. It’s far too many hours before Bloodborne reveals weapon, clothing, and item options to enable significant divergence from other players. You can level up a character dozens of times without realizing magic is eventually part of your repertoire, since the game doesn’t make spells available until many hours in. There’s little reason to dump points into the arcane stat that drives these spells, meaning players may have to grind for hours to make them viable. Bloodborne’s setup ensures newcomers have viable builds, but it also means veterans are locked in for a while, and you can’t do much until entering the inevitable New Game Plus. It’s not fun to stroll into a boss and walk all over them. On paper, that sounds great! “Ha ha, gotcha, game!” But that’s not what I’m here for. Those text messages I showed you only exist because we overcame a tremendous challenge, and there’s not much challenging about the game’s final hours, moments that should test everything players have learned up until that point. Instead, it gets kinda boring, and I got anxious to simply finish it. That’s not how I felt when I entered Bloodborne. That said, depending on the ending you get, Bloodborne reveals one hell of a great fight as it closes out. Just as I was stomping on through, I was suddenly getting smacked around. Gasping for air in the final moments was welcome, and it made the ending feel earned. Even when it’s over, it’s not actually over, if you want more. There are now multiple ways to keep playing the game after “beating” it. There’s New Game Plus, in which your character’s skills and equipment carry over, and enemies are harder than ever. You have access to the weapons and equipment you collected, providing an opportunity to develop a unique character in the way the game didn’t allow before. There are also Chalice Dungeons, randomized death traps designed to let you run around with friends and find some of the game’s best loot. Being able to run around with other people is so tremendously fun, and significantly alters the way you approach enemy encounters. I imagine I’ll be spending a lot of time down there. If you made it this far and haven’t played a game like this, you might be thinking, “Maybe this is is the one for me, and it’s time to see what all these folks are raving about.” I’d encourage you to do so, if only because I was in your situation about a year ago. It only took a few hours with Dark Souls before I was a convert, and I’ve been obsessed ever since. 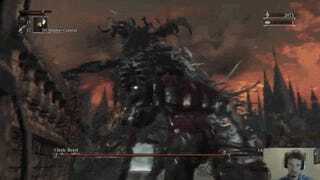 Is Bloodborne a good entry point? I don’t know. It’s a different kind of Souls game, yes, but still a Souls game, which means that it’s punishing and demanding. Bloodborne is what it is, and the Souls games have hardly ever compromised. They’re better for it. Where does Bloodborne ultimately rank, then, among the Souls games? No idea. It’s a question for another day, when Bloodborne’s had more time to sink in. Ask in a few weeks. But more importantly, does that really matter? Not at all. Bloodborne is a fantastic game all its own, and requires no experience with anything else to enjoy and appreciate. It may be a riff on an existing idea, but it forges a standalone identity. It’s special, and there’s little else like it. I could write about Bloodborne for another thousand words. I’ll certainly be doing that in the weeks and months ahead, as players around the world unlock more of its hidden secrets. Can I really transform into a beast? What other sects and covenants can I join? Does the game significantly change as players beat it over and over again? It’s uncommon to finish a game and still have so many burning questions about what’s left to be discovered, but that’s the kind of game Bloodborne is. Phew. Now if you’ll excuse me, I’ve got a New Game Plus mode that’s calling my name.